Professor Monte Belknap has been teaching at Brigham Young University–School of Music for nine years and previously taught at Brigham Young University–Idaho and Western Illinois University. At a young age Monte won several prizes across the country including top prize at the Starling International Violin Competition at the Aspen Music Festival in 1989. He went on to study with the world-renowned pedagogue Dorothy DeLay at the University of Cincinnati, College–Conservatory of Music, and was faculty for the Starling Preparatory String Project as a graduate assistant of Kurt Sassmannshaus. He has been a regular at the Park City International Music Festival since 2004. Of his playing with the PCIM Deseret News critique stated, “his playing was infused with finely crafted lyricism that was mirrored by the others”. He also performs with rave reviews as concertmaster and soloist at the Cathedral of the Madeline in SLC. In recent years Mr. Belknap has performed as a guest artist at the George Enescu International Violin Competition, the Barge Music Series in NYC, and served as concertmaster of the Illinois Symphony and Chamber Orchestras. Professor Belknap also presented a critically-acclaimed set of performances presenting the complete Beethoven Sonatas. Deseret News wrote of the sonata duo, they performed with “vibrancy and dynamic expressiveness”. Mr. Belknap also serves as the concertmaster and soloist with the LA East recording studio and has been the featured violin soloist on many sound tracks including “The Work and the Glory” movies, the “The Iceland Saints”, the online video games “Lord of the Rings” and “Dungeons and Dragons”. In recent years he has performed chamber music with international artists, Jeffrey Solow, Scott Ballentyne, Steve Balderston, Mark Kosower, John Novacek, Denise Djokic, Menahim Pressler, Miriam Fried and many others. This year he will be performing at the Park City International Music Festival. He will be the guest soloist with the Timpanogos Symphony Orchestra, the BYU Symphony Orchestra, the BYU Philharmonic and the Orchestra at the Cathedral of the Madeline. This fall the Deseret Piano Trio will be premiering the Barlow Endowment commissioned piece, “Lonesome Roads”, a piano trio by Dan Visconti, composition faculty from the Eastman School of Music. Next summer he will be teaching at the International Music Festival of the Adriatic in Duino, Italy. 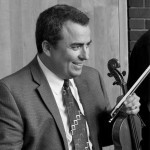 In 2010 Professor Belknap was awarded the “Studio Teacher of the Year” by the Utah State Chapter, of the American String Teachers Association (ASTA). He has presented six times at the national convention of ASTA and currently serves as the chair of the solo competition in Utah. His students regularly win competitions and are performing around the world. During the summers he teaches or performs at several Belknap Violin Camps training students and teachers with his acclaimed practice system. He also teaches at the summer music festival at Brigham Young University’s Summerfest Music Festival.